Sawfish are using virgin births as a survival strategy to try and prevent extinction, scientists have discovered. Sawfish off the coast of Florida have been found to be giving birth without mating with males. This virgin-birth phenomenon goes by the name of parthenogenesis. It has been recorded in many invertebrates and even in birds and sharks held in captivity but this is the first time it has been found in a wild population. Scientists at Stony Brook University, in New York, who were conducting a study of sawfish found 3% of sawfish captured displayed this strange characteristic of giving birth without the need of a father. They believe that the sawfish might be reverting to the strategy as a way to avoid being wiped out by overfishing and the destruction of their coastal habitat. 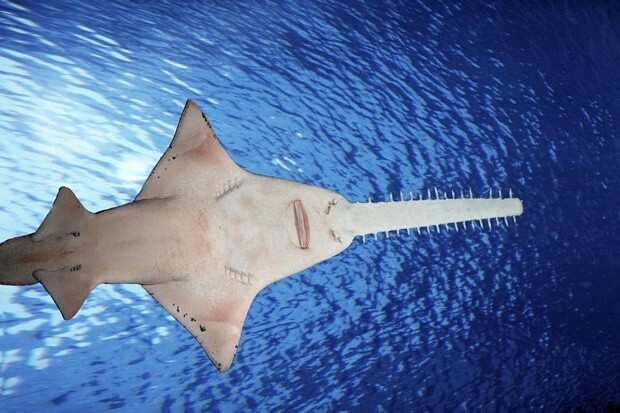 Sawfish, which get their name from their distinctive long nose crenellated with teeth that they use to attack their prey, are in danger of becoming the first entire family of marine animals to be wiped out by man.